Defconn finally met his ideal type actress�Jo Bo Ah! During the June 17 installment of KBS2TV's '1 Night 2 Days',� Jung Joon Young became the PD for the day to plan an 'Overcoming Weakness' tour special for the rest of the members. 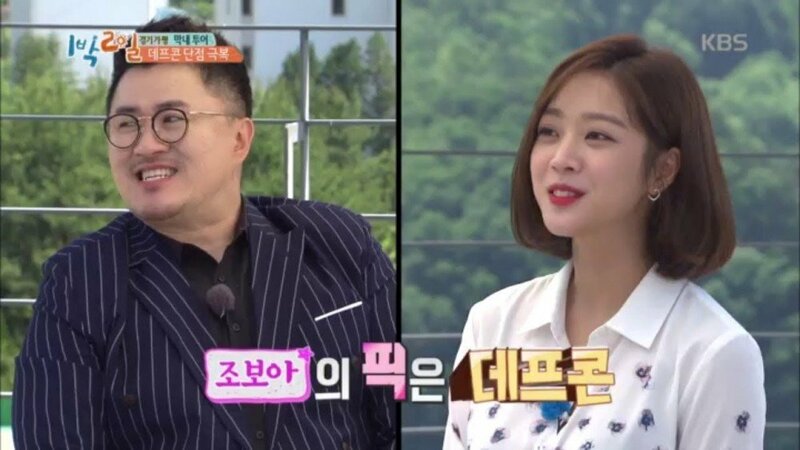 For a segment, Jung Joon Young and the staff held a meeting to make Defconn become the most amazing man possible and to do this, Jung Joon Young personally recruited Defconn's ideal type Jo Bo Ah. When Defconn saw Jo Bo Ah in real life, he couldn't hide his excitement and quickly became flustered. Defconn cautiously started the conversation, "I mentioned in the past that I'm a fan of you." To this, the actress replied, "I'm a fan of you as well.�Thank you for referring me," indicating that she was aware of the situation. The two shared a brunch and some small talk as well, getting to know each other better such as hobbies, ideal types, etc. Did you catch Jo Bo Ah on '1 Night 2 Days' this week?